Prime Minister Narendra Modi's announcement last night, that Rupee notes of denominations 500 and 1000 will be withdrawn, triggered unnecessary panic. People flocked to their nearest ATMs, which then ran out of Rs 100 notes, which in turn led to full-blown alarm. But most of this panic is unwarranted. While there may be some discomfort - as the government gets the logistics in order - here are some points to keep in mind. The main reason for the change in currency denominations is to curb the financing of terrorism and the use of funds generated from fake currency towards subversive activities like espionage, and the smuggling of arms, drugs and other contraband into India. In his address, PM Modi also highlighted that the move would go a long way in eliminating black money, which has engendered a near-parallel economy in India. High denomination notes are known to facilitate black money generation. Figures shared by the Finance Ministry suggest that while the total number of bank notes in circulation rose 40% between 2011 and 2016, the increase in the number of Rs.500 notes was as high as 76%. In the same period, the circulation of Rs.1,000 notes rose a whopping 109%. RBI governor Urjit Patel has already announced that new Series bank notes of Rs.500 and Rs.2,000 will be introduced starting November 10. The infusion of Rs.2,000 bank notes will in fact be monitored by the RBI. The central banks said the new series of bank notes will be significantly different from the scrapped ones in look, design, size and colour, and this will help combat counterfeiting. Anyone in possession of a large stash of black money should be worried. In fact, an impact is already being felt in sectors like real estate, where cash transactions make up a significant percentage. In July 2010, the World Bank estimated the size of India's shadow economy at 23.2% of the GDP figure of 2007. And the government said while announcing the scrapping of Rs 500 and Rs 1,000 notes that the measure would curtail that shadow economy, which would in turn reduce inflation as well as conspicuous consumption. The PM assured the nation last night that his government's measure will not hurt the poor and the middle class. "Black money leads to inflation which adversely affects the poor and the middle classes more than others," he said. The government said that those with unaccounted-for money have crowded out the honest tax-payer in the real estate market. This step then will not only bring parity in that market, it will also lower real estate prices. Another area where people with unaccounted-for money have crowded out honest tax-payers is in higher education. 'Capitation fees' have put higher education out of the common man's reach. Now, parity is expected in this sector too. As I&B Minister M Venkaiah Naidu said: "Prime Minister forewarned the people, given enough time to declare their money and pay taxes. Demonetisation of Rs.500 and Rs.1000 is aimed at rooting out black money. Genuine people will not have any problem, only corrupt people and people with illegal money only need to worry." Why there's no need to panic? 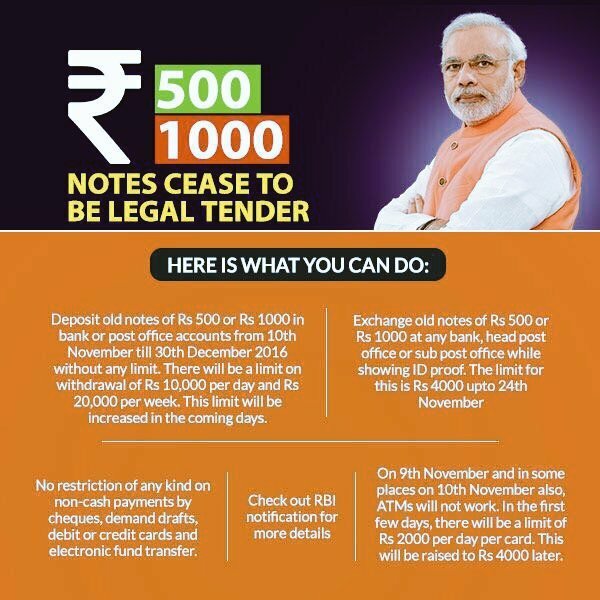 The government has allotted a total of 50 days during which people can deposit their Rs 500 and Rs 1,000 notes in the bank. To exchange up to Rs 4000 in cash - for valid currency - people may go to any bank with valid identity proof. For more than Rs 4,000, banks won't hand over cash, they will instead credit its equivalent of valid currency to consumers' bank accounts. Once ATMs are functional, people can withdraw up to a maximum of Rs.2,000 per card per day until November 18. After that, the ATM card withdrawal limit will be raised to Rs 4,000. This may also be the time to pull out those fusty cheque books, or brandish that new credit or debit card. None of these non-cash forms of transaction are affected by the demonetization. For the next 72 hours, places like petrol pumps, crematoriums and railway stations will accept the old high- denomination currencies. For now, the best thing would be for people to educate each other to stem any needless panic.